We are so happy to report that our sweet Gunnar has found his forever home. His foster mom decided they couldn’t live without each other!! His forever mom writes “Gunnar is officially mine. I failed at the whole foster thing as I always sorta knew I would. I’m thinking now that Gunnar and I found each other at just the right time for the right reasons!” Congrats on your new life sweet pea!! We love you! Greys anatomy litter all adopted! ELLIE MAE came in and went right in to foster to adopt, thanks to the perfect pre-approved application. They made it official today 6/24/15! Congrats! 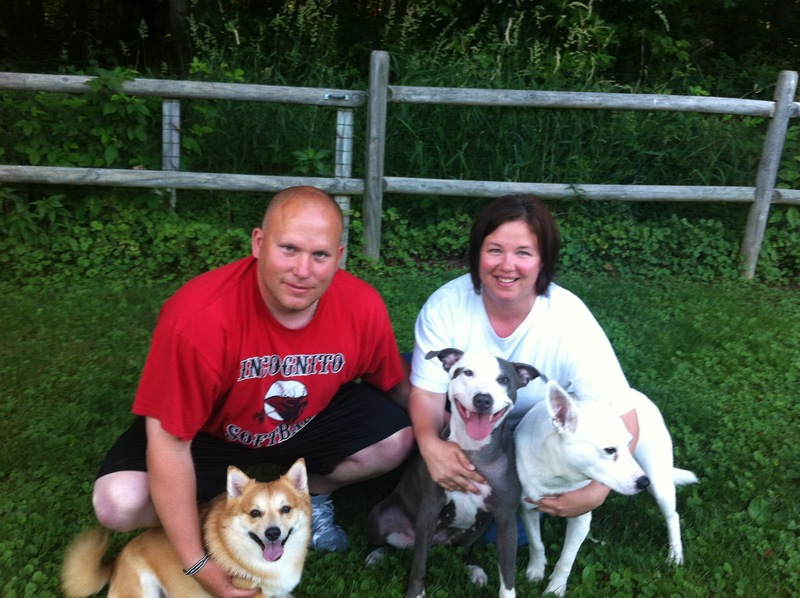 MACKENZIE ( pictured right) was officially adopted 5/30/15! We are so happy that you found your forever home sweet girl!!! Congrats, we love you! HANK was officially adopted 5/9! We received an adoption application, with no dog specified, the only qualification was “dog must love our cat, we can work through anything else”. Hank was the perfect fit, in more then just that way! Hank absolutely hit the jackpot with this family as well. We couldn’t be more HAPPY for them all! BUTCHIE was officially adopted 5/7/15! SADIE has truly found her forever home! Congratulations to you all! Officially adopted 3/19/15! BELLA RAE, now Flower, has found her fantastic forever home! She was our most recent desperate save, on November 17th, after being hit by a car on November 15th! For her full story please see https://www.facebook.com/media/set/?set=a.699255966848925.1073742019.155390631235464&type=3. Officially adopted 3/14/15! Happy Gotcha Day FIONA our St. Patty’s Day girl!!!! Welcome to your new life!!!! Adopted 3/14/15! 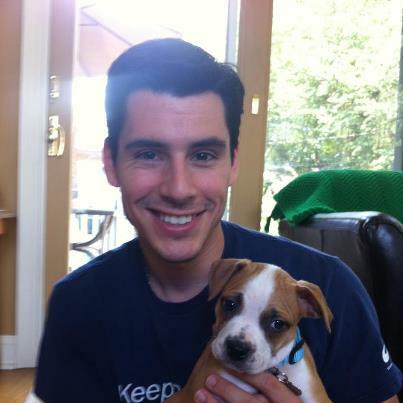 Handsome MEMPHIS is no longer singing the blues….he found true love and is living a good life with his forever family! He was saved from an overcrowded shelter, so his open kennel will make room to save a new dog. He was with us for less than a week before he went in to foster to adopt! Officially adopted 3/8/15! JAMES DEAN, now Duke, was rescued from an overcrowded shelter that sadly has to euthanize for space. 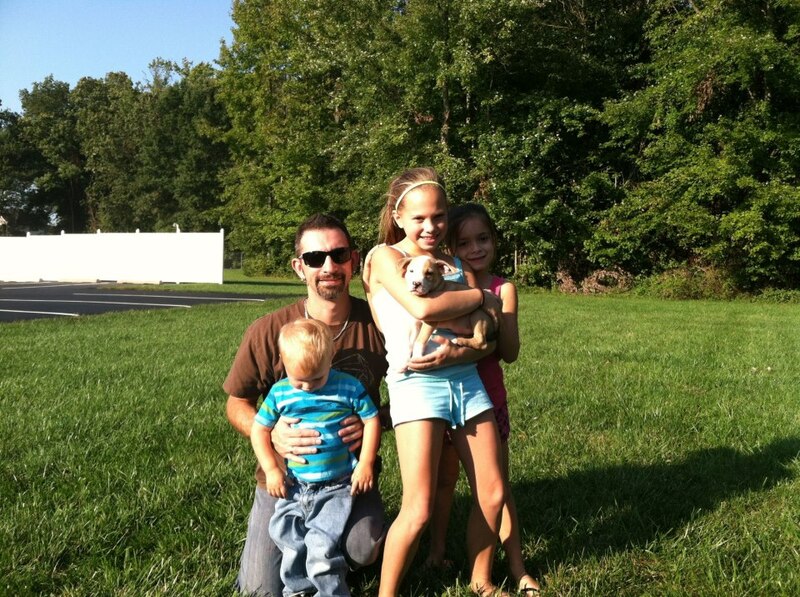 After a short time with PBP he’s now in his forever home with PBP alum Jersey! Jersey finally convinced the family it was time to add a new doggy friend to the pack. Handsome adoptable James Dean was a perfect fit. We love when all of our of rescue dogs find a home, but love that two of our dogs our now living a great life together! Officially adopted 3/8/15! PIPER ANN has been officially adopted. Congrats sweet girl!!! NEVAEH has been officially adopted 2/23/15! This sweet girl and her two 5 week old puppies were rescued from being locked in a basement for 3 weeks. They were taken to an overcrowded open intake shelter. We were so happy to help give them a chance at a better life. Nevaeh’s found an amazing forever home and a new best friend in her “sister” Leia. We are so happy for all of you!!! Congrats to SANTRIANI on finding his forever home today! We are ecstatic that he will be loved and spoiled! Officially adopted 12/13/14! AJ, now Bo, has found his forever home! Congrats on your new life sweet boy. 12/6/14! BUBBA GUMP has been officially adopted! We pulled him from First State Animal Center & Control where he was just known as an ID number but now he has a name and a forever home! 11/15/14! HAZEL( now known as Abbie) has found her forever home. She will be loved for the rest of her days like she deserves. Congrats, sweet girl! Officially adopted 11/8/14! ZEUS, has found his wonderful forever home! He came from a very neglectful situation but never held a grudge. He’s had a rough road but that’s all behind him now. Congrats sweet Zeus! Official adoption 9/26/14! STURGIS found his forever home! 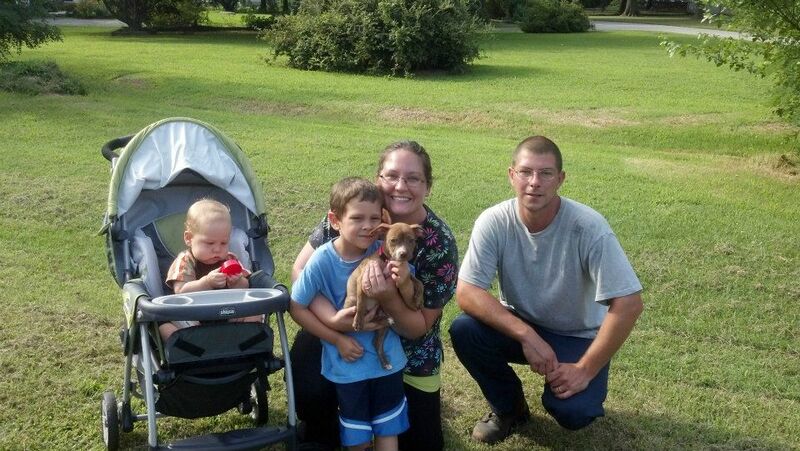 Official adopton 9/26/14! JOSIE, Josephine Maria, has been adopted 9/19/14! As you can see she had a long road, but is now in a very, very loving forever home! HARLEY’S litter was rescued from a high kill shelter, and he had no problem finding his forever home! Congrats Harley! Adopted 9/11/14. SANTINO has been adopted into his true, forever home 9/3/14! We are very happy for Walter, PBPs Outreach Coordinator, and Santino to finally be together. We know this is truly a match made in heaven!! 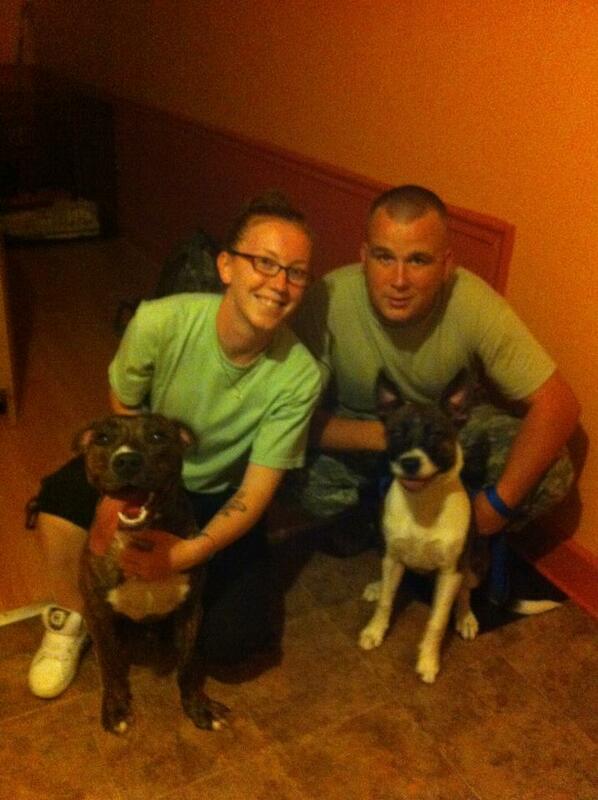 Happy Tails to both of you!! ODINhas been officially adopted on 8/23/14. Odin was found severely beaten, suffering 3 skull fractures, orbital fractures and was instantly blinded at the hands of humans. Even after the trauma he suffered he loves everyone he meets! Odin spent the last few months recovering in a loving foster home and regained his eyesight and strength. Odin beat all of the odds against him. He was found lifeless and alone in a dark alley. Odin’s previous owners found him and waited 24 hours before they called animal control. When Odin was brought to Veterinary Specialty Center of Delaware the doctors were not certain he was going to make it. We would like to thank First State Animal Center and SPCA for saving Odin and taking him directly to Veterinary Specialty Center of Delaware to receive life-saving care. Odin owes his life to the doctors and staff at VSCD and we could not be more thankful. 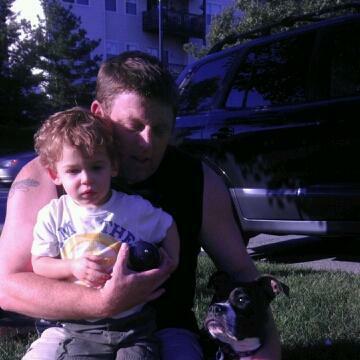 On May 28, 2014 we took Odin into Pit Bull Pride of Delaware. His wonderful foster mommy and daddy taught him how to walk up and down the stairs, taught him verbal commands to lead him around the house, and he was supervised 24 hours a day. They even put his crate next to their bed so they could watch him sleep. Once he was recovered he liked to spend his days in his favorite pool and playing with his foster brother Ace who taught him the rules of the house. They became inseparable and we believe Ace helped Odin recover. Odin had a hard time recovering from his neuter surgery but the wonderful doctors at Windcrest Animal Hospital took wonderful care of him when he stayed in their ICU. He has fully recovered. A few short weeks ago, Odin was placed into a foster to adopt home where he instantly became part of their family. Don’t worry, he is not far from his previous foster home and they see him whenever they want to. He now has two amazing adoptive parents, three human kids to play with, another pittie (who is a previous Pit Bull Pride alumni ) named Nala, and a kittie. Odin had a follow up appointment with his ophthalmologist this morning. He no longer has any blood in his eyes but he is starting to show signs of cataracts in both of his eyes ( from the trauma he suffered). That did not deter his family from wanting to make it official because they love him so much. Odin has touched thousands of people from all over and we are so ecstatic that we were able to help him have the best chance at an amazing life. We can promise you then he will NEVER suffer abuse again and we will be sure to keep you updated while he lives in his forever home. We were able to save Odin because we had an open foster home available. We are not going to stop hunting for the person(s) who did this because we want Justice for our sweet ODIN!!! Happy tails sweet boy! We love you so much!!! How has Odin’s story touched your life? 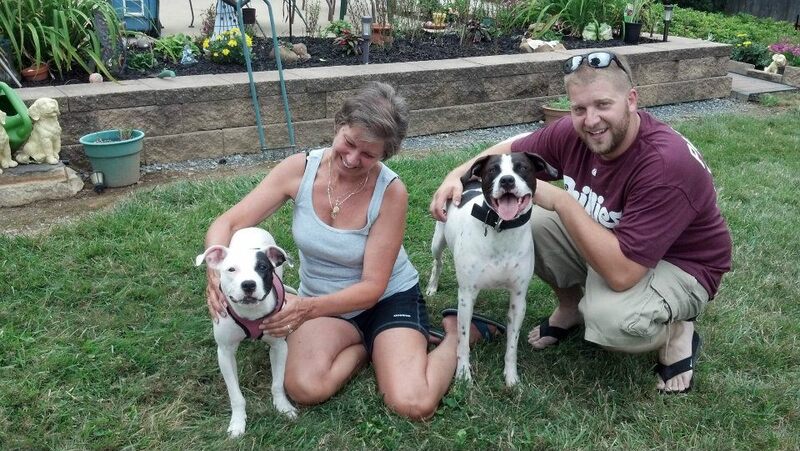 MOLLY LOU & LEO have been officially adopted 8/13/14! 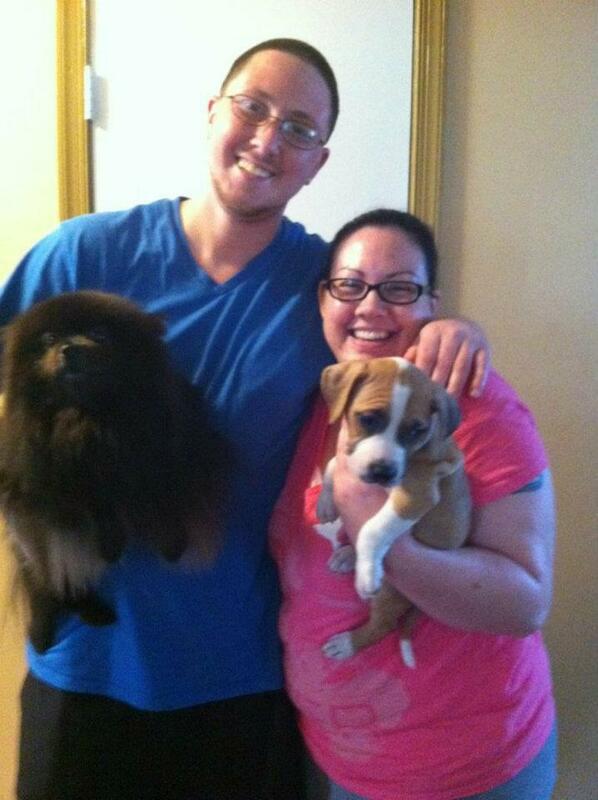 The dynamic duo have found a BIG, wonderful, forever family! They will never again be without the love they deserve. JERSEY girl has been ADOPTED!!!! She couldn’t have found a more perfect family to spend the rest of her life with!!! Officially adoption 7/10/14! SOPHIE k/n/a Reggie went from being in a shelter to a loving home due to the kindness of a volunteer! Officially adoption 6/29/14! NINO (formally Ace) was rescued from a high kill shelter and got adopted. Unfortunately he was returned to us due to unforeseen circumstances, no fault of his own. He’s been in a great foster home patiently waiting for her forever home, but little did her know he’s been there all along, her foster family adopted her officially 6/28/14! PATRIOT has found his forever home!!! As you can see he has a lot of people to show him love!!!! 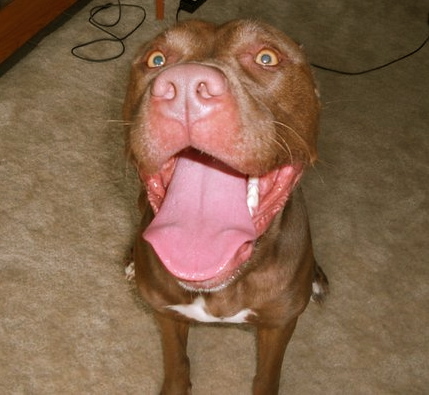 We are also very ecstatic to report that his new brother was also a previous Pit Bull Pride dog ( Hulk). Officially adopted 6/15/14! We are very happy to report that DAISY MAE has been placed into an amazing forever home. Colby, her new brother/ BFF, was also a PBP rescue dog. We are so happy that they can spend the rest of their years together with their amazing parents!!! Officially adopted 6/9/14! After less than 2 months with PBP, BLOSSOM has been officially adopted! We took Blossom into our rescue March 2014 after she had been with A Buddy for Life (ABFL) for 2 years. Unfortunately, because she was a senior pit bull dog that had separation anxiety, she did not have any interest while at their shelter. Adopted 5/23/14! Our sweet boy BO was officially adopted tonight by a tremendous family. We are so happy that he has started his new life! Congrats sweet boy! Adopted 5/5/14! ADDIE MAE/JUNEBUG came to us from an over crowded shelter after she was rescued from a bad situation. All that is behind her now as she has found her forever home with a wonderful family! Happy tails sweet girl! Adopted 5/3/14! LUKE and his brother Bo were rescued from a high kill shelter. We did not even have a chance to post him ( shown left) on our Facebook page BC we had an approved application prior to getting him in our care! Congrats Luke on finding your forever family! Adopted 5/2/14! BROCK came to us with a URI and frostbite. We pulled him from a high kill shelter and he was almost euthanized because they were out of space. 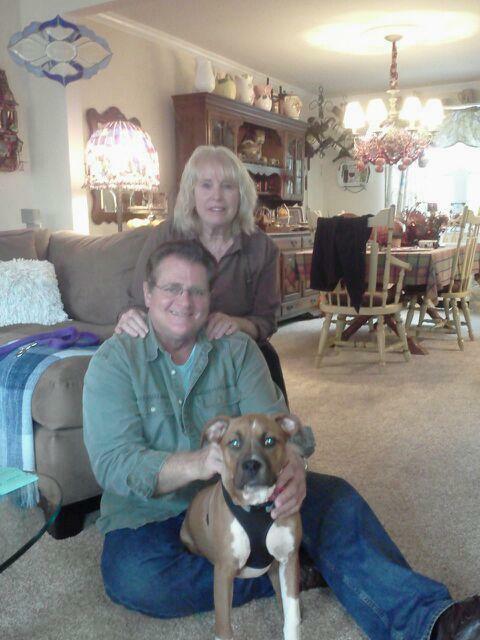 He has fully recovered and is happy to share with everybody that he found his forever family. He is beyond ecstatic that he has a family that he can grow old with. Happy adoption day Brock, 5/1/14! PUDGE was in an over crowded shelter after being rescued from a neglectful situation. She no longer has to worry about any of that as she’s found her wonderful forever home! Officially adopted 3/21/14! PEARL was a 15 week old puppy that was going to be thrown into the streets before a friend of one of our core members got involved. She’s now found a great forever home. Adopted 3/17/14. Our sweet PUMPKIN has found her forever family. She was pulled from a high kill shelter and was shy with both humans and other animals but extremely sweet. After being in 2 wonderful foster homes her shyness lessened and now she found a wonderful family who loves her for exactly who she is. Adopted 3/11/14. CALI was rescued from an overcrowded shelter a just over 5 months ago! We are beyond excited to announce that our sweet Cali has found her forever home! She has been officially adopted 2/18 and we couldn’t be happier! 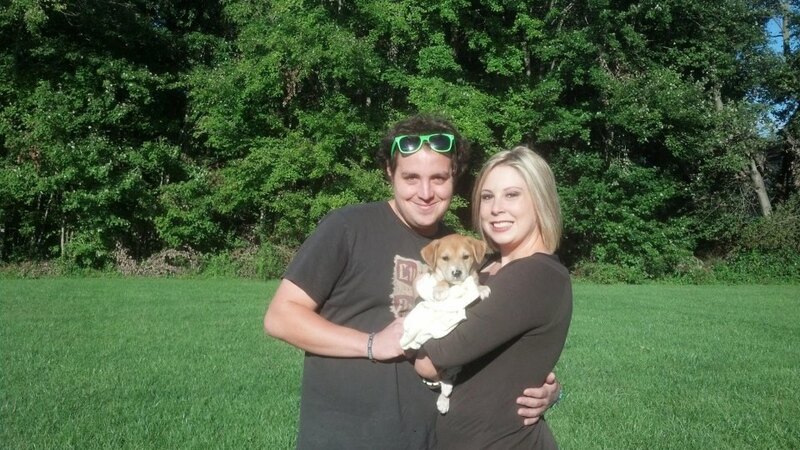 Congrats Callie on finding your forever after with Thor ( previously Bear who we rescued from Safe Haven). DANCER, now known as Kora, has found the perfect forever home. She is super spoiled and loved. Dancer had a previous owner that did not have her spayed. When she delivered 6 puppies, her owner delivered her and the puppies to a shelter. Dancer was extremely skinny and has old scars on top of her head. She has been spayed so she will never have another litter of puppies again. Congrats sweet girl because you deserve it!!! Adopted 1/29/14! VIOLET now Zoe was rescued from an overcrowded shelter. Thank you to a wonderful family she’s now in her forever home. Officially adopted 1/22/14! COMET, last but not least #6 of the reindeer pups adopted 1/12/14! Congratulations sweet boy! Guess who got officially adopted today, Jan 11th??? Yup, you are right it’s our sweet J.R. He has waited for months for his forever family to come along. He was rescued off of a chain and came to us being heartworm positive. He now has a forever family and is heartworm negative! His family has decided to keep his name bc it is short for Johnny Rocket. They plan on getting him a GPS for his collar (even though we know they will not need it). They want to thank all of our dedicated volunteers for searching on Xmas Eve/Day for him. We are so happy that he is officially adopted. Congrats J.R. we love you so much!! BLITZEN was lucky #5 of the reindeer pups adopted 1/10/14! Congratulations sweet boy! 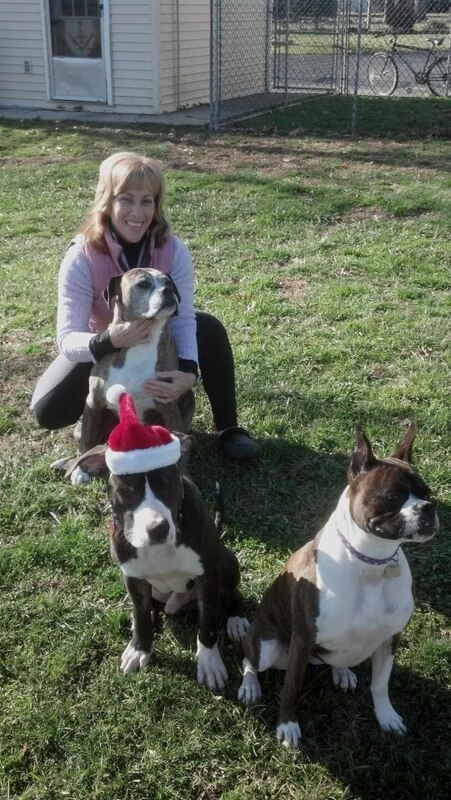 DASHER was lucky #4 of the reindeer pups adopted 1/9/14! Congratulations little girl! SNICKERS joined the PBP family in November after she was surrendered to a local shelter. 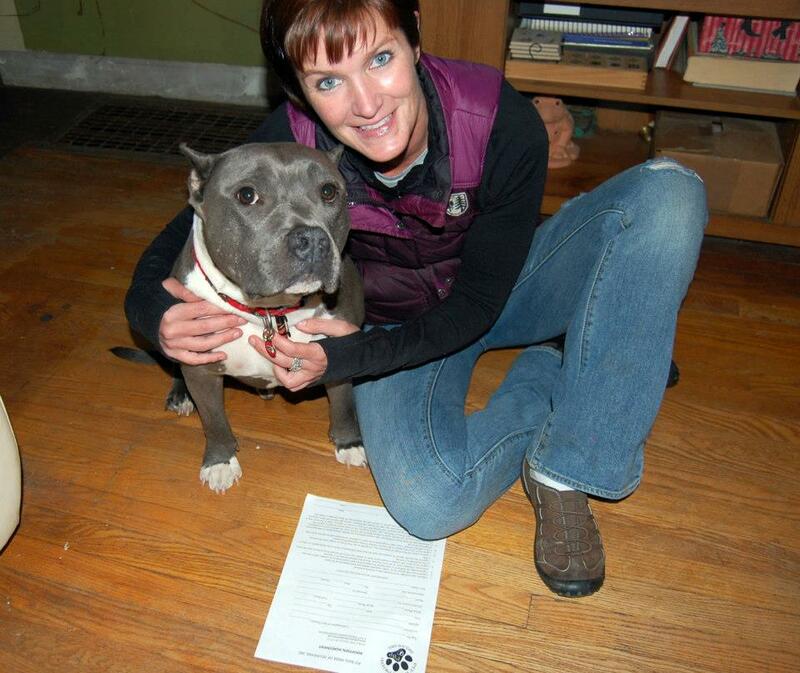 We are happy to report she’s found her true forever home, officially adopted 1/6/14! We are so thankful for all the wonder people who rescue! 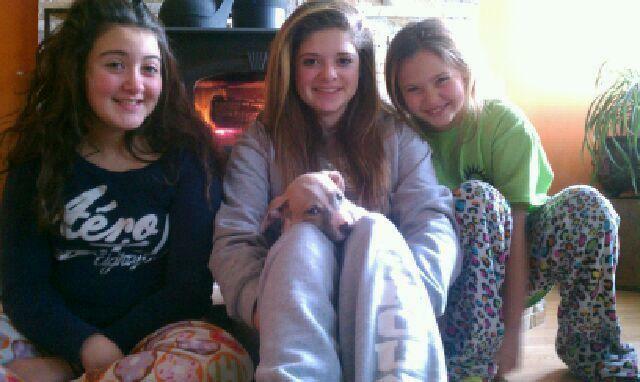 PRANCER was lucky #3 of the reindeer pups adopted 1/4/14! Congratulations sweet boy! CUPID was 2nd of the reindeer litter to get adopted 1/4/13! Congrats sweet baby girl. 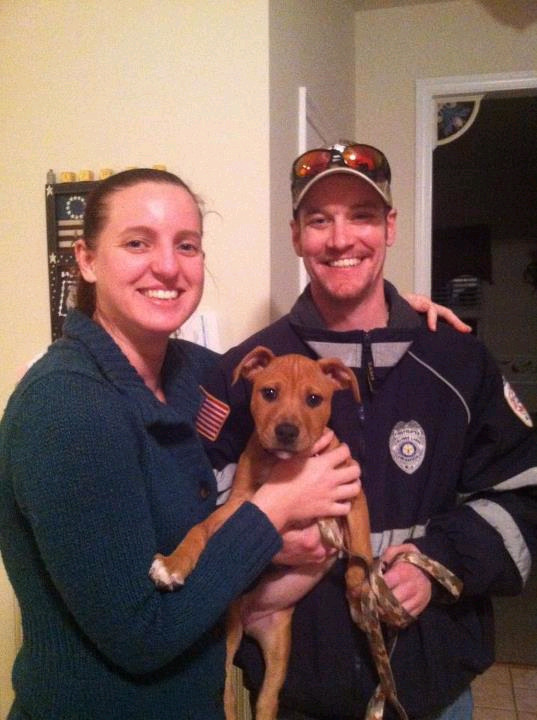 VIXEN the 1st reindeer pup adopted 1/4/14! Congrats sweet girl! 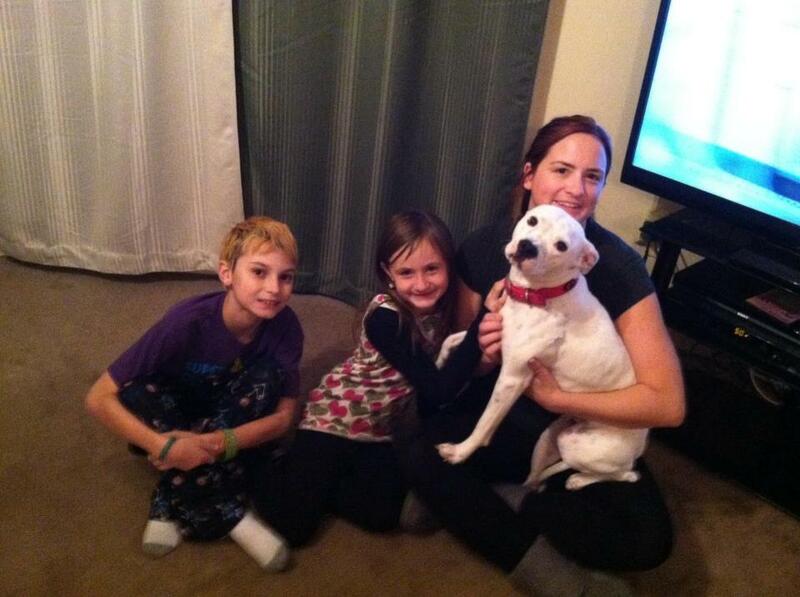 LOLA now known as Dakota has been officially adopted 12/29/13! 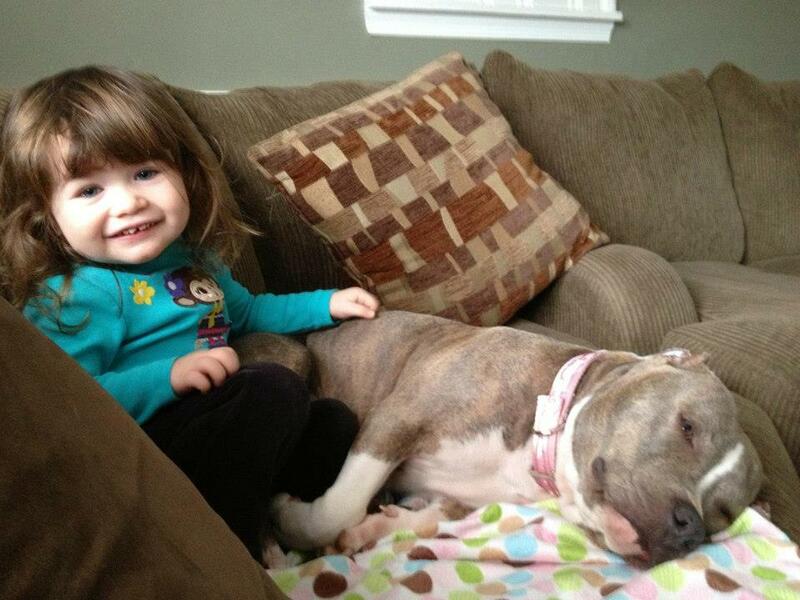 Lola’s owners couldn’t keep her because their landlord discriminates against pit bulls. Thankfully we were able to take her and find her her true forever home. WOO HOO PENNY SUE! Penny has found her forever home! Officially adopted 12/27/13! Our sweet Penny Sue was rescued from a life of horror in July of 2012. She lived her days on a chain and was kept outside. PBP was notified about a dog in need and rushed over to the scene immediately. Penny came to us with behavioral issues and she had to be the only animal in the home. We worked hand in hand with our amazing behaviorist and Penny began her rehabilitation with PBP. Even though some dogs take a little longer than others to find their forever home we are dedicated (HOWEVER LONG IT TAKES) to find them a perfect home. We are beyond ecstatic to announce that our sweet Penny Sue has found her forever home and was officially adopted tonight. Penny will live the rest of her days very loved and happy. Congrats Penny Sue, we love you. BOHDI has been officially adopted, by no other than his fosters! WOO HOO! Made official 11/20/13! We pulled Bohdi from a high kill shelter in August 2013. 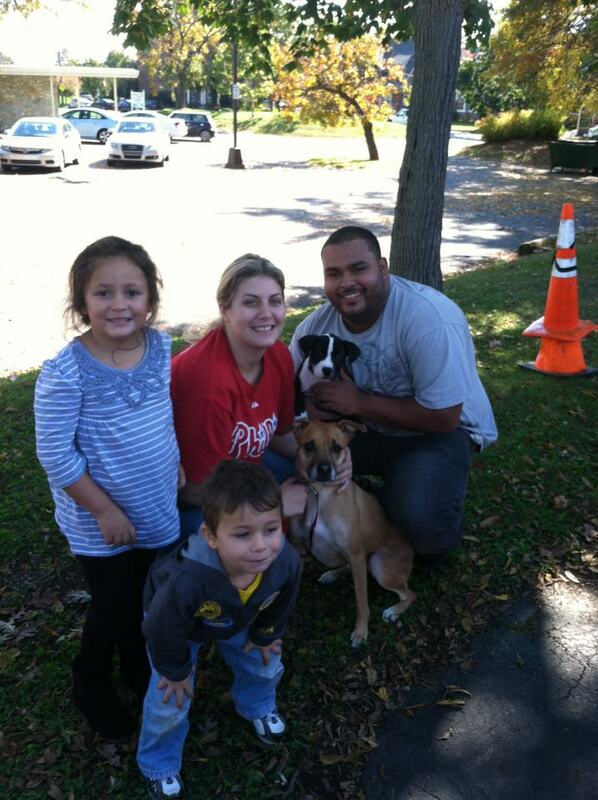 WOO HOO ALEXA, now Ally, was officially adopted today 11/9/13! Alexa was adopted from us after we rescued her momma and siblings. Unfortunately a year after she was adopted her family could not keep her so she came back to us in May 2013. 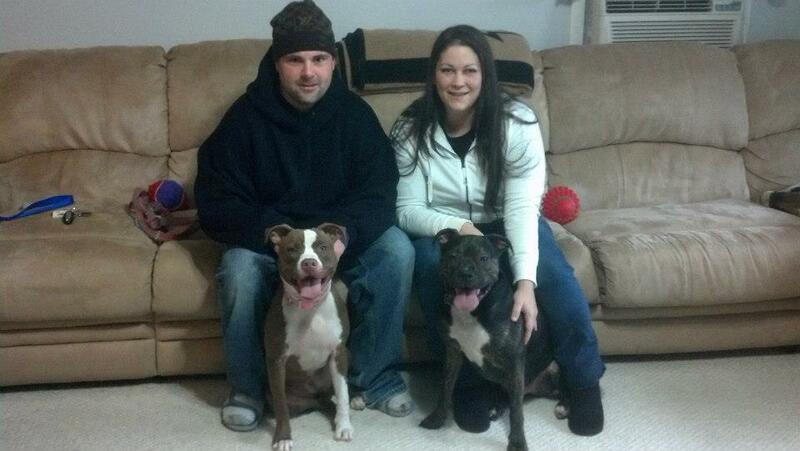 SMAUG (pictured left) has been officially adopted today 11/2/2013! You may recognize his BIG brother Zeke (pictured right) PBP alumni! Smaug was pulled with his sister from a high kill shelter in October 2013. What an awesome way to start the weekend and month! RIZZO now Riggs got adopted, 11/1/2013, and loves his new family, 2 & 4 legged! 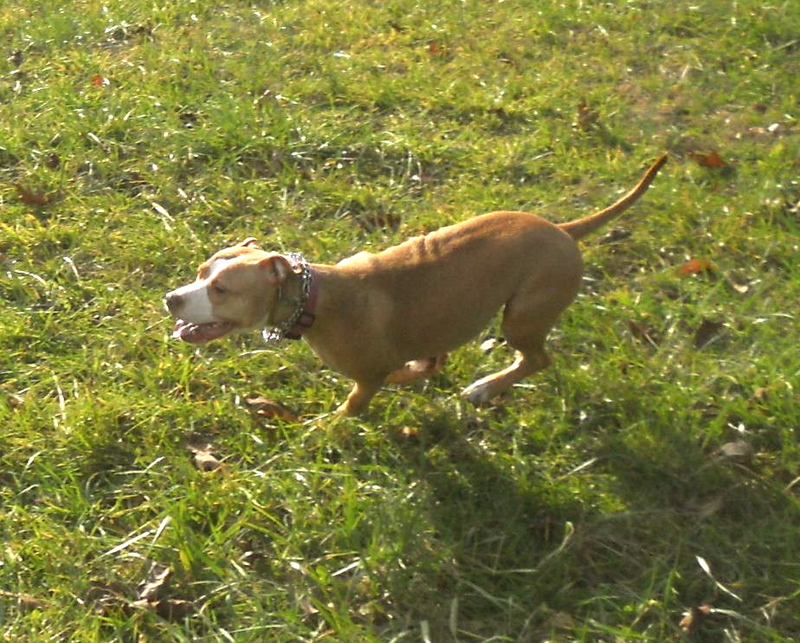 Rizzo was found running the streets of Wilmington, DE in January 2013. A great family took him in and tried to find his home but no one came forward and because of their traveling they were unable to keep Rizzo so he joined the PBP family. Our sweet and lovable SANTINO has been adopted 10/30/13! (pictured left to right, Diesel, Santino and Onyx). We saved Santino from a high kill shelter in April 2013. His patience paid off, because he’s in the perfect forever home. 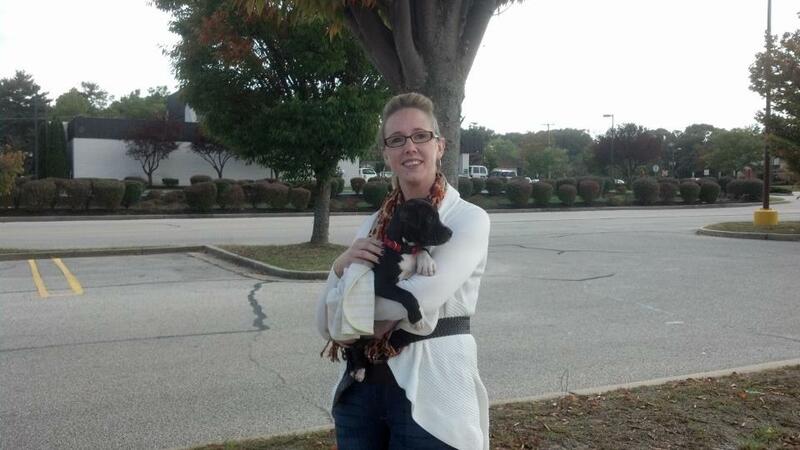 WOO HOO IRIS’ adoption was made final at our 2nd Annual Brunch on 10/27/13! We rescued Iris from a high kill shelter where she was all alone. Our SUPER sweet and lovable ATTIKUS found his forever home! Adopted 10/15/13! We pulled Attikus from Safe Haven in July 2013 after receiving an urgent plea from them. We are very happy to announce that CECE as been officially adopted! Congrats, sweet girl! Adopted 9/21/13! Poor CeCe is a victim of breed discrimination and lost her family in August because of it. Thankfully it wasn’t long before she found her true forever home. The girls at PBP are beyond ecstatic tonight. We pulled BEAR, now known as Thor, from Safe Haven a few short weeks ago. He is 16 months old and spent 14 of those 16 months in a kennel. After only being with us a few shorts week we found him the PERFECT forever home. It took him a little while to figure out how to be a dog again. He never saw stairs or was not used to being in a car. After he got some tender loving care from a dedicated couple in our core group he was ready to spread his wings and fly into his forever home. Congrats Bear, we love you so much! You deserve it boy! Adopted 8/20/13! We are so excited that our sweet OSCAR has finally found a home of his own. He will grow up with a pittie sister named Bella and they were instant BFF’s! Congrats, we love you!!!! 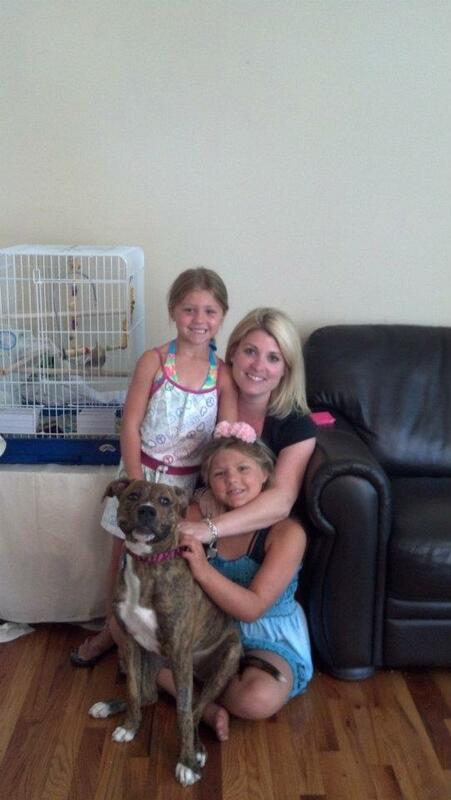 STELLA Luna has been officially adopted July 26, 2013! She was the mother of our last litter and we couldn’t be happier for her. We pulled her and her 10 babies from a high kill shelter and now they all have awesome forever homes. Happy tears Stella! 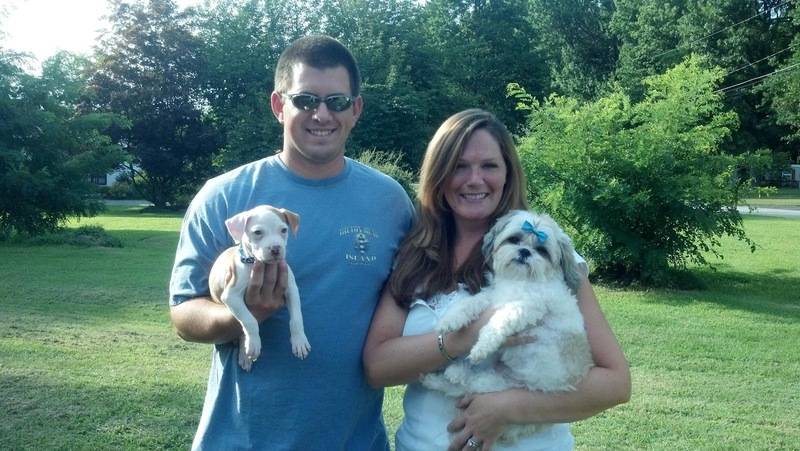 Our sweet CHARLIE (mom of the top gun litter) has found her forever family. We saved Charlie and her 8 babies from being euthanized on Mother’s Day. They have all been adopted into amazing homes and we couldn’t be happier. Congrats Charlie July 26, 2013! 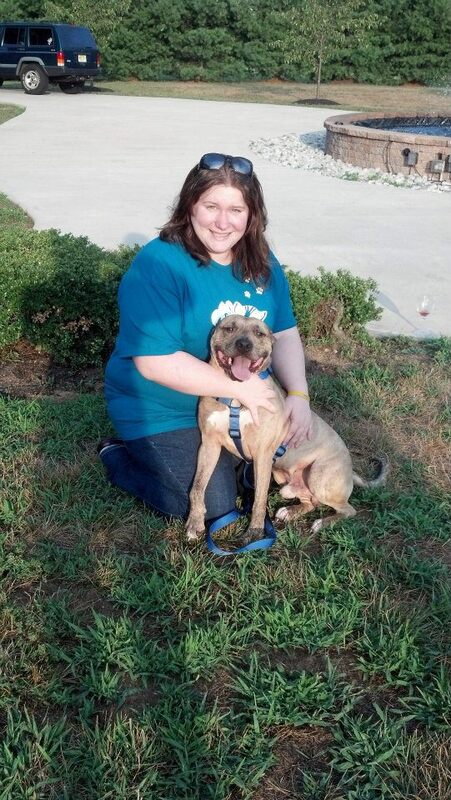 Then all the others followed, WOO HOO CHASE found his forever home, 7/9/13! WOO HOO BAILEY found her forever home, 7/9/13! WOO HOO ZOE found her forever home, 7/9/13! WOO HOO MILO found his forever home, 7/9/13! WOO HOO CADEN found his forever home, 7/9/13! Victory now known as Toki was officially adopted 7/8/13! What a wonderful end to a very long, rough road! Flying up from behind is our sweet, girl VIPER, adopted 6/22/13! ICEMAN found a forever home!! He left the flight deck 6/15/13! Another Top Gun puppy has left the flight deck! Congrats JESTER on being adopted!! Adopted 6/9/13!! Our beautiful blue girl MAVERICK has found one amazing family to call all her own!! Congrats Maverick we couldn’t be happier for you!!! Adopted 6/9/13!! 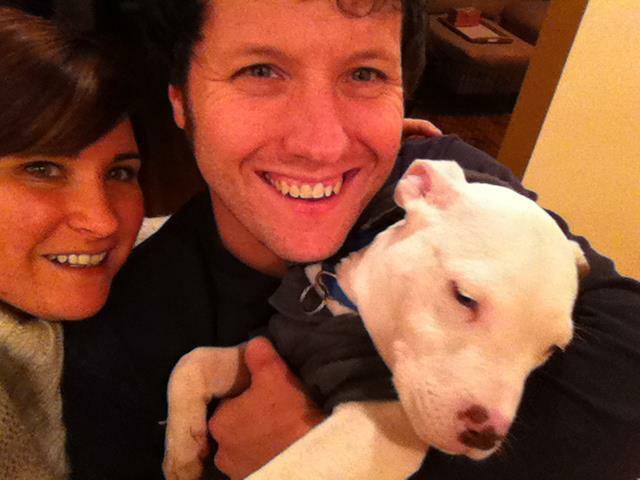 HOLLYWOOD looks pretty fly with his new family! Congrats Hollywood and happy tails! Adopted 6/8/13!! Our little GOOSE man took flight with his new dad today! Happy tails Goose! Adopted 6/8/13!! VELMA from our Scooby Doo Gang was adopted!! She is now known as Hazel and loving life!! Our sweet CINDERELLA went from being on death’s door suffering from pneumonia and stage 4 heartworm disease at a high-kill shelter, to being rescued by PBP of DE and the love of a foster family to now being an official family pet!! We absolutely LOVE happy endings! Happy tails sweet little Cindy! Our friend FRED has found his forever home. This is 1 happy bunch of dudes! Adopted 5/31/13!! Happy tails Fred! It only took our little ACE man 15 days to find a forever home! Ace loves his new family especially Princess – his new canine sister. Happy tails Ace!! Adopted 5/31/13. It was love at first site! Our little JACK met the perfect match -he was adopted 5/16/13!! 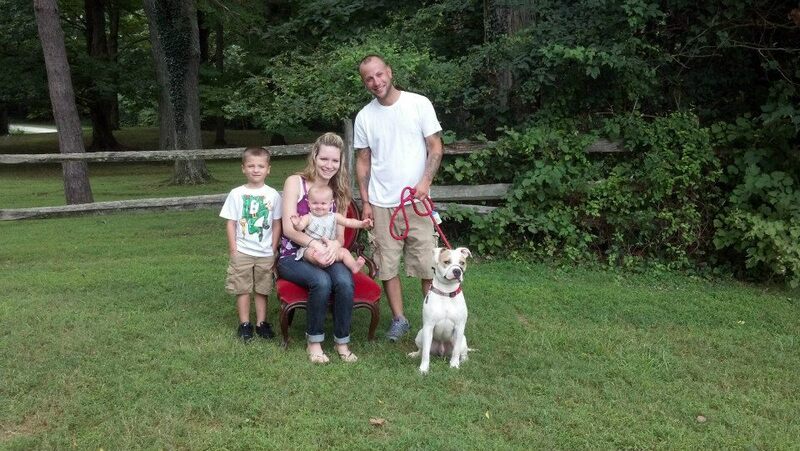 Our sweet and adorable DAPHNE the Scooby Doo gang found her forever family! Happy Tails Daphne! Adopted 5/11/13! WOO HOO MAX has been adopted on 5/10/13! It took a little longer then expected but Max has found his perfect, forever home! Max was definitely a PBP favorite! DAISEY MAE has officially completed her Physical Therapy and has found her forever home. What a week!!!! Congrats beautiful girl, you’re sure to have the most amazing life a dog could ever have! We couldn’t be happier for all of you!! CHIPPER made his foster Mom, Dad & Brother fall completely in love with him. They soon realized that they couldn’t bare not to add him as the newest member of their family. 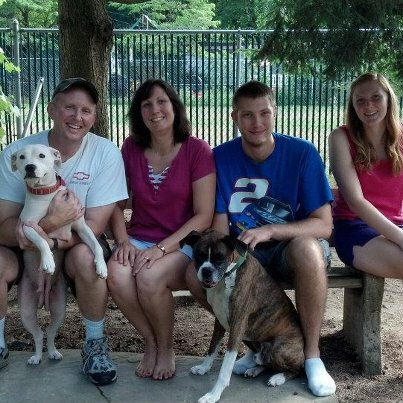 Congrats Chipper on finding the most amazing family a dog could ever wish for. You’re sure to be one spoiled rotten pup. To top it all off, they still want to foster for PBP. It doesn’t get much better than that. Thank you so much Maria, Kevin & Gonzo for welcoming Chipper into your family. We love you all!!! It’s a good thing MARLEY has so much love to give, or else his new family would be “fighting” over him. Marley came to PBP in August, got adopted and unfortunately had to come back to us recently when his family had to relocate into a home where they couldn’t have pets 😦 Fortunately for Marley he only spent 12 hours back @ PBP before the Zeauskas family decided to give him the forever home he has always dreamed of. Congratulations Marley on hitting the JACKPOT with this truly AMAZING family!!!! It’s official, Fallon, Brandon and Logan have a new family member!!! HENDRIX is thrilled to have a new big brother (Logan) and a wonderful new Mommy & Daddy!! Congrats to all of you!! Adopted 3/12/13! 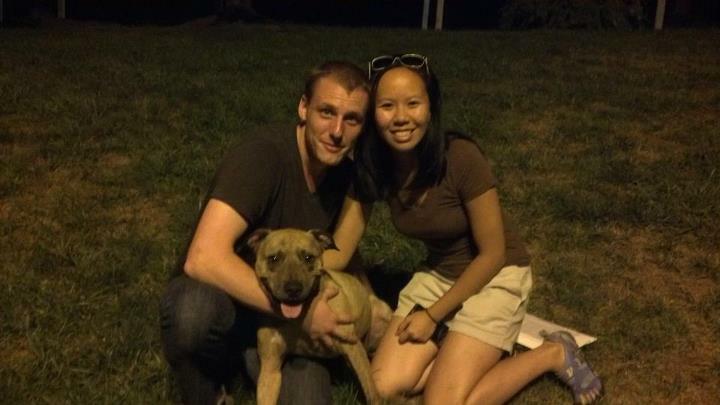 Congrats to our sweet NAHLA, on finding the perfect family!! We’re so happy for all of you 🙂 Adopted 3/10/13! OZZIE now Jasper has found his wonderful, forever home! 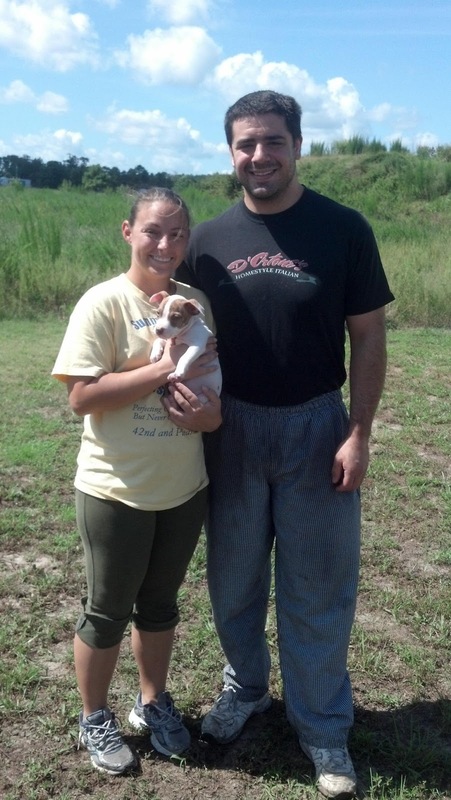 They are so happy to have found such a great puppy, and we are just so happy to have found such a great family! Adopted 3/6/13! TIG has his forever home! Thank you so much, Jamie & Patricia for opening your home and heart to this sweet boy! Adopted 3/3/13! ROXY has been officially adopted! She will never have to sleep on a cold concrete floor again, because as you can see there’s nothing but comfy couches in her future. Her new Mommy adores her, and the feeling is obviously mutual! ADOPTED 2/25/13! RUCKUS, now Kingston, has found his forever family today. From now on he’ll only know what it’s like to be spoiled rotten. 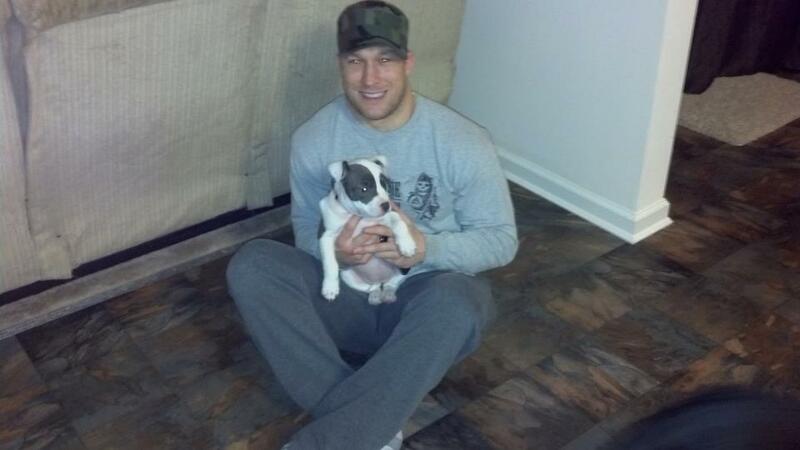 Thank you Kevin & Kelsey for giving Ruckus such an amazing home!!! ADOPTED 2/24/13! GYPSY was saved from a high kill shelter, and now has no worries, because she has found her forever home! She’s definitely a Daddy’s girl! ADOPTED 2/20/13! 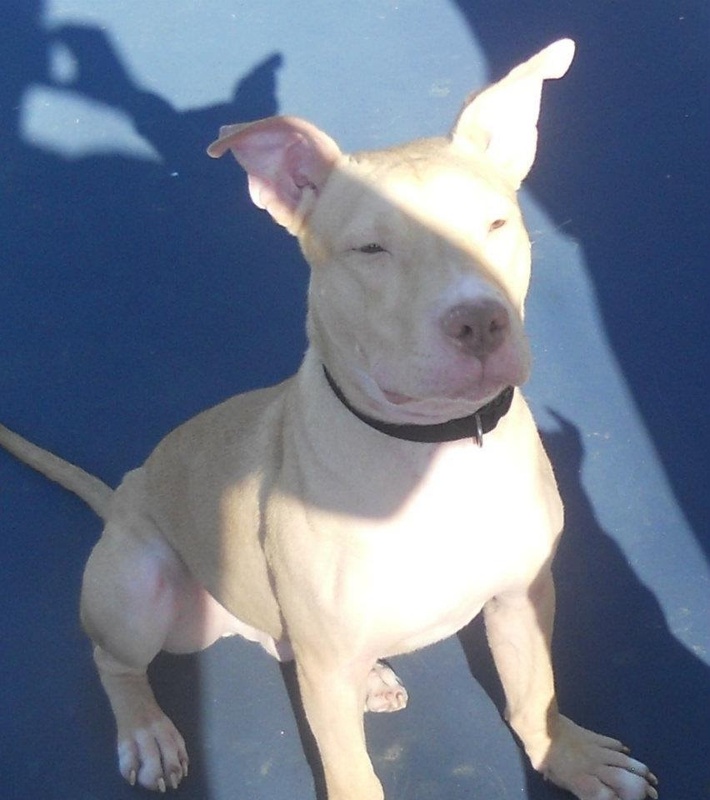 ZEKE has officially been adopted 2/16/13….Wooo hooo!!!! Special thanks to Jan & Ken for seeing all that Zeke had to offer and doing such a great job making sure he and his new brother Gunner would be best friends forever!! Congrats to you all!! SERENITY is jumping for joy on this Valentine’s Day because her foster family just loves her so much that they have decided that she can’t go to any other family. Serenity got officially adopted today. She has touched our hearts in so many ways. Serenity came to us unwanted and pregnant. She gave birth to 8 healthy puppies after only 4 days in our care. Serenity has come so far since the day that we got her. We are so happy that the first family that showed her love decided that they couldn’t let her go. Congrats, Serenity! We love you! ADOPTED 2/14/13! WALTER’S wish has come true. He has been officially adopted and we couldn’t be happier. Walter just adores the kids and follows them everywhere. Congrats Walter! We love you! Adopted 2/3/13! Congrats to our handsome THEODORE on finding his forever home! We couldn’t be happier for you! You’re sure to be one spoiled pup!! Adopted 1/31/13! 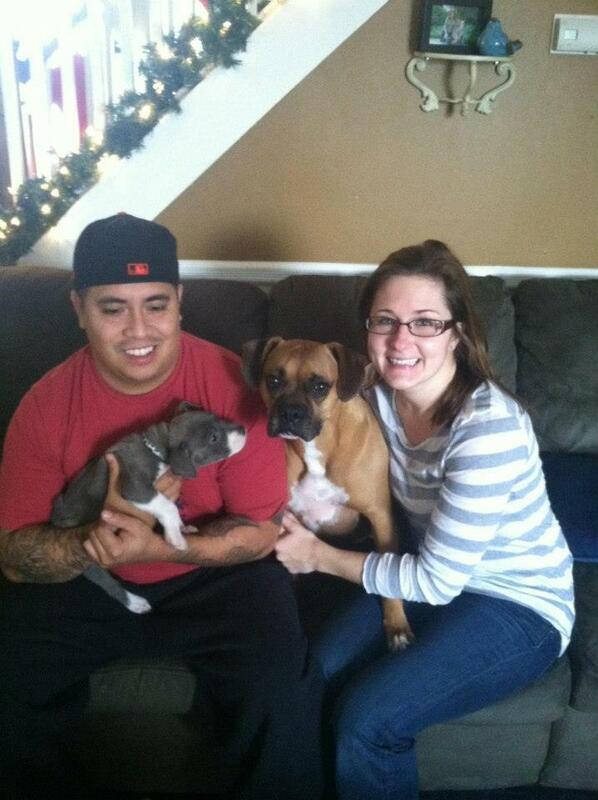 Congratulations ALVIN, now Bruno, for finding your forever home! You are a very lucky boy! Your furry brother Sonny is definitely going to give you a run for your money, and we know you’re going to love it! Adopted 1/26/13! VEGAS has been adopted! He’s so happy to be right where he belongs. Thank you so much to his foster family for giving him the TLC he needed until his perfect match found him! YAY VEGAS! Adopted 1/24/13! Sweet SNOOPY was rescued at 12 weeks. We couldn’t resist those baby blues and neither could his new Mommy & Daddy. Thank you so much for blessing this sweet pup with his forever home! Congratulations to the first of our “Chipmunk Litter” to be adopted, SIMON found his forever home today and will spend the rest of his life being treated like a rock star! His new sister Stormy can’t wait to show him the ropes! Adopted 1/13/13! Our beautiful BELLA has just made PBP history for being adopted 5 hours after officially being taken in by the rescue. Bella came to us as an owner surrender from Delaware that just so happened to fit the criteria of an approved adopter! She made a quick “pit ” stop at the vets office for some shots and a check up before being officially adopted a few hours later. Timing is everything and this was meant to be! 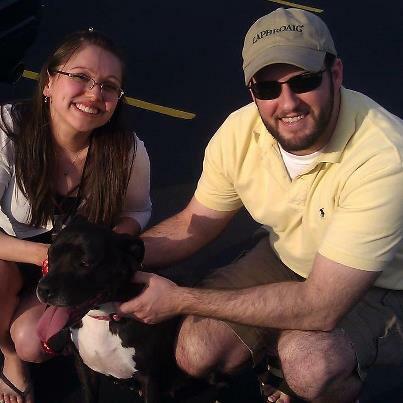 Congrats Bella on finding your forever family!! Adopted 1/8/12! STELLA and her litter were found in an abandoned house before making their way to us. We’re happy to report that she and all of her puppies have been adopted! Congrats Stella, and to all your puppies on finding your forever homes! Congrats to our beautiful JASMINE on finding the home of her dreams!! We couldn’t be happier for all of you! Special thanks to the Ulshafer Family for giving this sweet girl a fabulous forever home!! There is NO PLACE like HOME for the holidays!!! We are so happy to report that PHOENIX, our super strong survivor, was officially adopted today!!!! 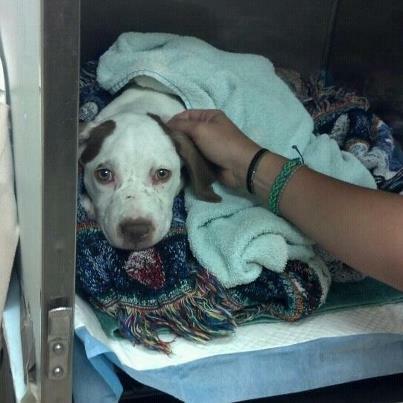 Phoenix beat the odds and fought for the incredible life he is about to live. When Phoenix was first taken in by PBP his chances of survival were slim, he was deprived of food by his previous owners for so long that his body was giving up, despite what… was done to him at the hands of humans, he fought for his life and proved everyone wrong by pulling through and becoming a loving member of our pack! Phoenix has come such a long way and we couldn’t be happier that the Wilhere Family saw his true potential and decided to make him a part if their family. He will never again know abuse or neglect! Congrats sweet boy, you’ve been an inspiration to all of us! Woo hoo, SOPHIA, now Tinkerbell, is a LUCKY girl! 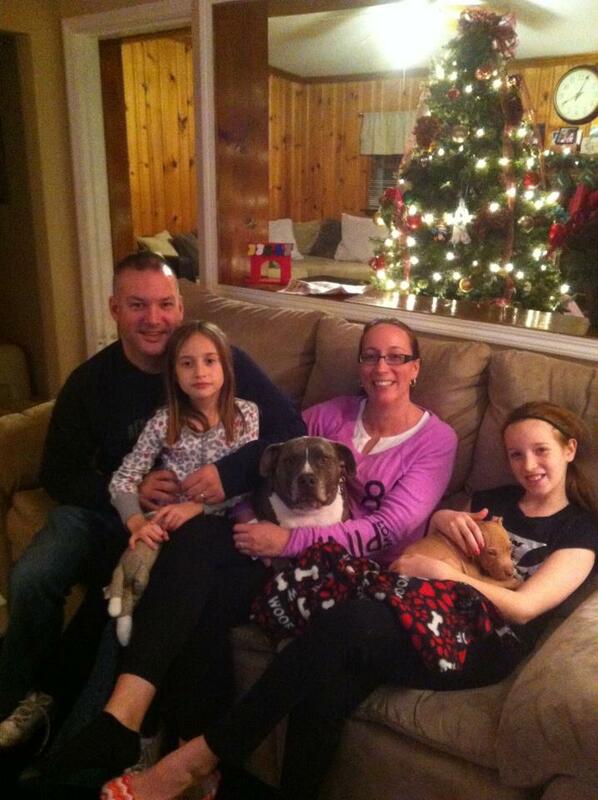 She’s in her forever home and loving her wonderful new family :o) Thank you Tom, Stacey, Jocelyn, and Wendy! Congrats BELLE for finding your forever home! She has two new doggy friends, Checkers and Zara! She will be loved for the rest of her life and we are so happy for her! Merry Xmas sweet girl, we love you so much! Adopted 12/21/12! We have had a busy week! It is official, NEMO has found his forever home! He is so happy to be in his forever home just in time for the holidays! Congrats, Nemo! Adopted 12/22/12! It’s official…ALFIE has been adopted by his foster family! We are so happy to announce that HOLLY has been officially adopted. She is the first of the 3 girls to find her forever home. 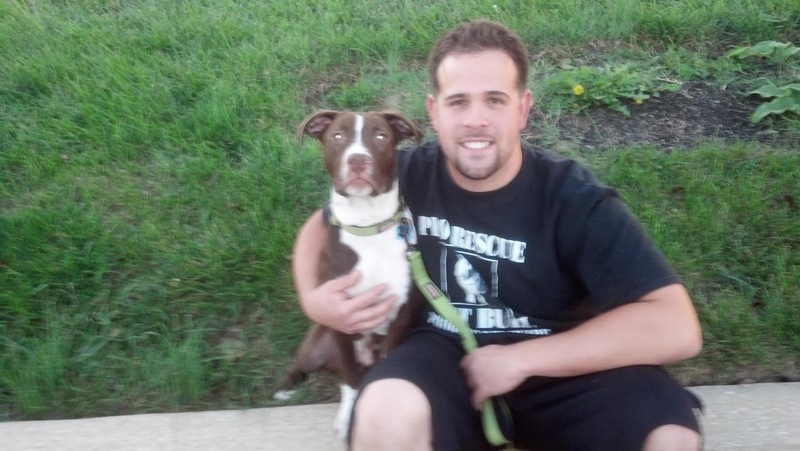 Her new dad is so excited because this is his first rescue! Congrats Holly! Adopted December 10, 2012! We are beyond EXCITED to announce that our precious AUTUMN has found her FOREVER family! She is now the protector of two very sweet kids who love her already! 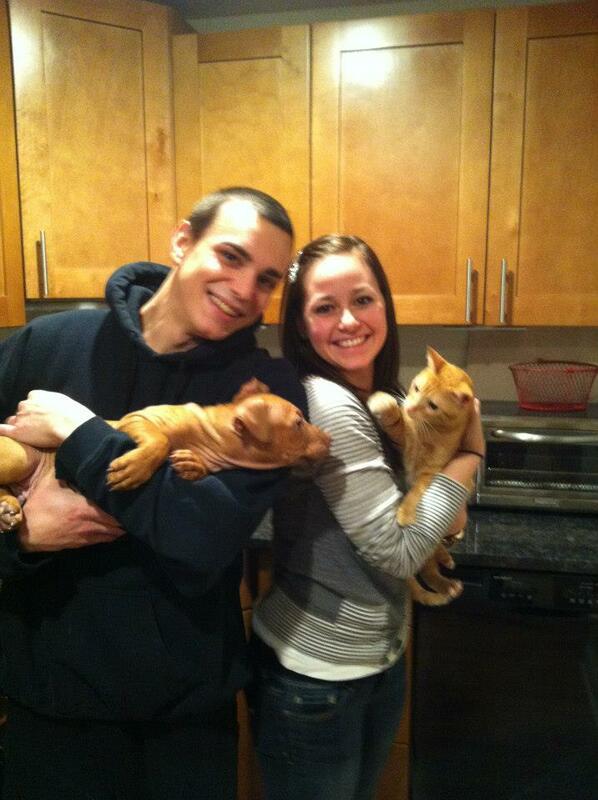 We are so happy that Autumn has found the absolute perfect family! Congrats! REESE was the last one to find her forever home out of her 8 brothers/sisters.We are beyond excited to announce that was our sweet Reese has officially been adopted on 12/4/12. She is so excited to start her new journey with her new parents and with her new pittie sister! We love happy tails! BELLA (Gidget) has only been with us for a short time but in that time she has found her forever home before Christmas! 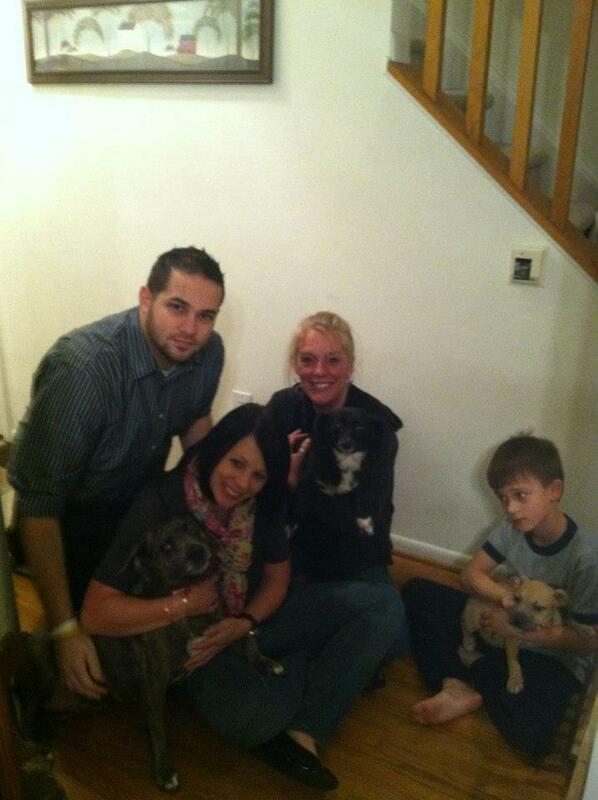 Congrats Bella on getting adopted on Wed 11/21/12. We love you sweet girl! 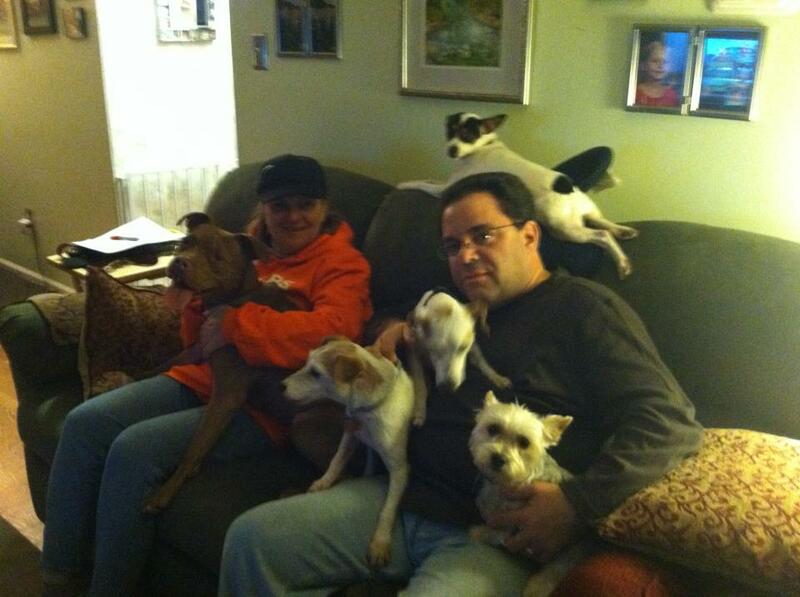 ‘Look at sweet RUBY with all her fur siblings and human mommy and daddy! She’s so incredibly loved already and is doing GREAT in her new home! Congrats Ruby! Adopted 11/4/12. What a wonderful way to start the weekend! Our sweet HANNAH has been officially adopted! Our sweet princess just loves her new parents and her pittie brother! Congrats Hannah! We love you so much! ♥ Happy tears ♥ Adopted 11/2/12! We were still able to complete an adoption today even with the hurricane approaching. Our sweet SADIE was adopted today and we couldn’t be happier. Congrats Sadie! We love you! Adopted 10/28/12! We are beyond thrilled to announce that our sweet BAMM BAMM has been officially adopted. We know that he will be spoiled by his forever family and we could not be happier! Adopted 10/26/12! We love you little buddy! Congratulations to MIKE on finding his FUR-ever family. We couldn’t be happier for you!! 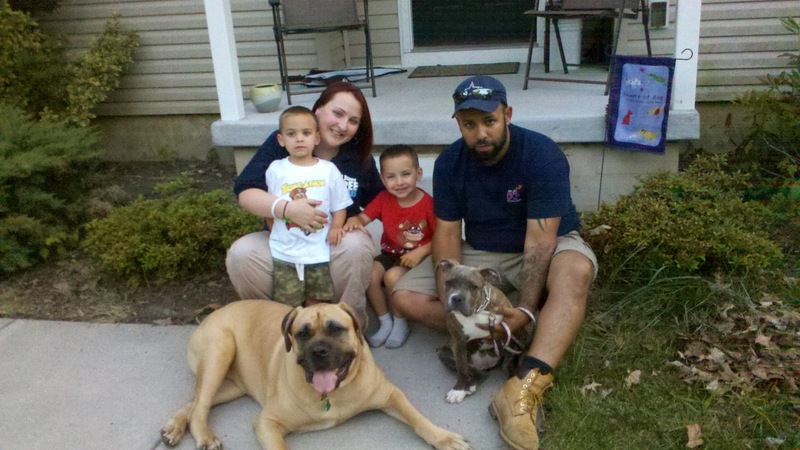 Thank you to Mike, Katie and the entire family for giving our sweet Mike such a great home! Adopted 10/21/12! 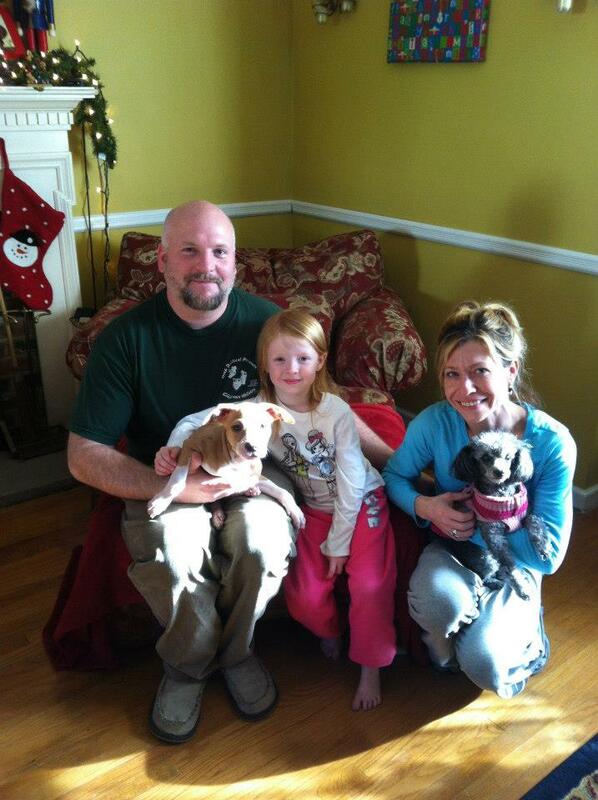 TWIXIE now known as Riley, has been officially adopted by her new family! 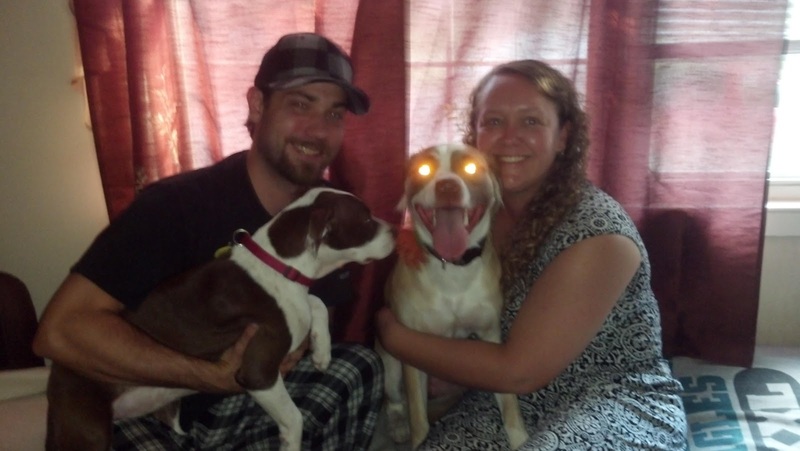 They are so excited because this is their first rescue dog and they couldn’t be happier! You go girl! You have touched our hearts and we can’t wait to watch you grow up! ♥ Happy tears! Adopted 10/16/12! SKITTLES (now Linc) went home to his new mommy today! His brother Westy (formerly Henry) lives nearby so they’ll get play dates! Congrats Skittles! Adopted 10/12/12! 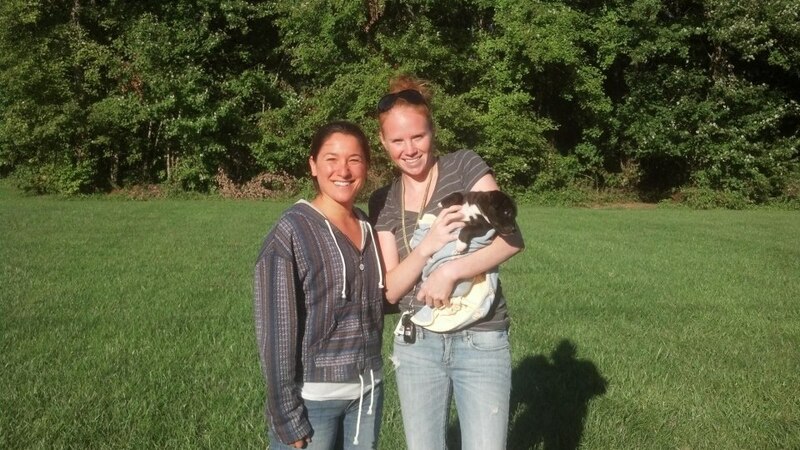 Handsome IKE went to his new loving home with his amazing mommies! He was officially adopted 9/23/12. Our sweet NESTLE got her wings today. She is going to enjoy the good life with her new parents. She has been officially adopted on 9/23/12 and we couldn’t be more ecstatic. 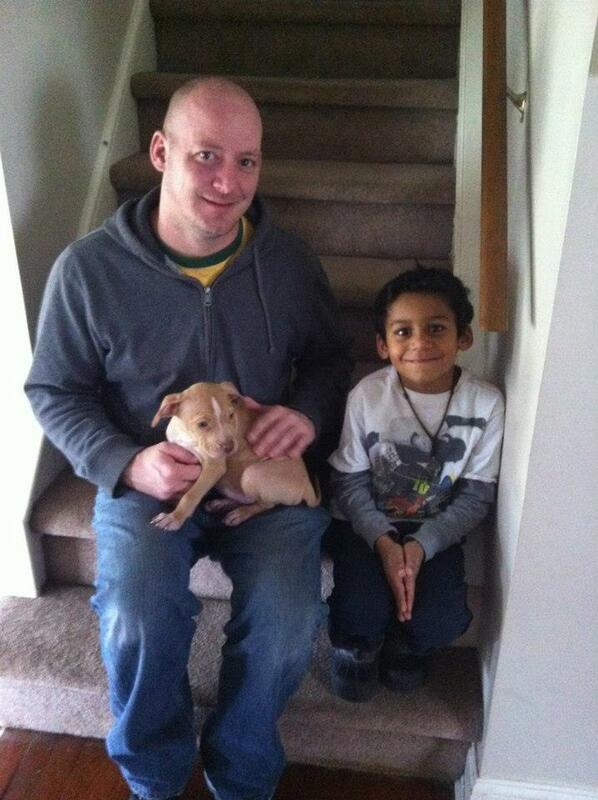 Little miss LOLLY found her fur-ever family and they love her already! Congrats, Lolly! Adopted 9/22/12! HENRY was welcomed with open arms to his new family! Congrats, Henry! Adopted 9/22/12! Brody was officially adopted September 20th, 2012! He was found in Camden, NJ as a stray severely underweight. 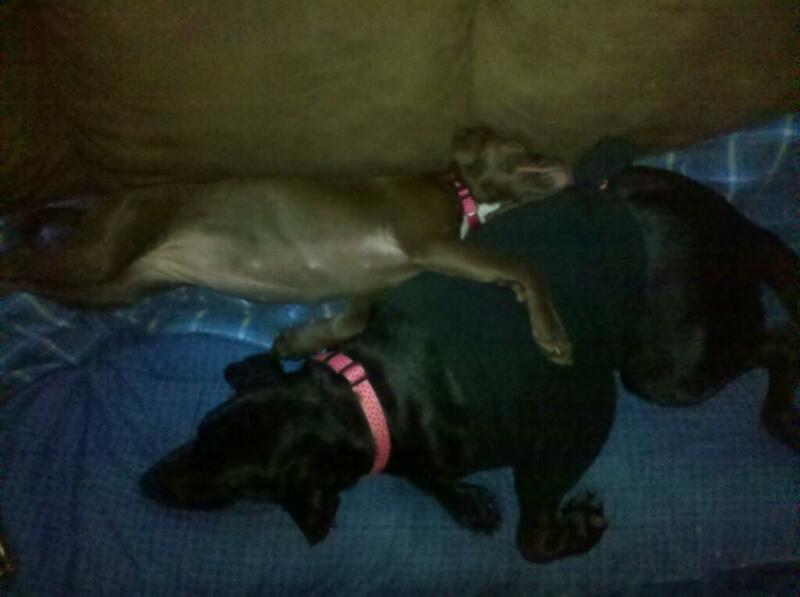 Now he is living the good life with his pittie sister and his amazing foster family! They loved him so much that they decided to make it permanent! Congrats, Brody! Our sweet Marley boy went home with his forever family today! Adopted 8/19/12! Our sweet Bandit has finally found his forever home! Bandit went from being a stray and into the arms of his loving forever family! Adopted 8/13/12! Our precious Cindy Lou was officially adopted on 8/13/12. We pulled her from a shelter in Maryland because her time was up due to space. Here she is pictured with her new family and we are certain she will continue to touch the heart of every one she meets! Welcome home, Cindy Lou! Our last little angel found her wings and flew home with her forever family last week! She was pulled from a shelter in Maryland. She was officially adopted on 8/8/12 and we couldn’t be happier for her! We love you, Alexa! It’s official! Natalie was adopted today, 8/5/12, by her forever family. She is tickled to death to be part of her forever family’s life and thinks everyone should come visit them at D’Ortone’s Italian Restaurant in Bethany Beach, Delaware to hear about their amazing experience with Pit Bull Pride of Delaware while enjoying an unforgettable meal! Congratulations, Natalie! 🙂 We love you! Look at this perfect match! Abby was pulled from the Pspca. Abby and her 2 sisters were covered in bite wounds because they were used as fighting bait. That did not affect this sweet girl from finding her forever family. 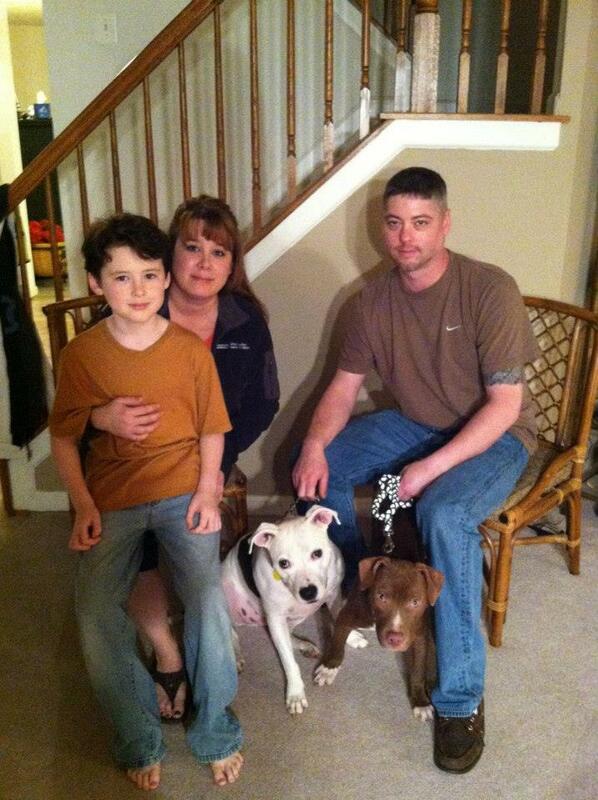 Pit Bull Pride of Delaware is excited to announce another successful adoption has happened. Abby was officially adopted on Friday, August 3, 2012! Here she is pictured with her older sister. Looks like she is making herself right at home! Congratulations, Abby! Our precious little April was officially adopted on 8/1/12. Here she is with her forever family and sister. Congratulations, April! We love you so much and are so happy for you! Dylaney was officially adopted on 7/30/12! This sweet little angel stole the hearts of her forever family immediately! 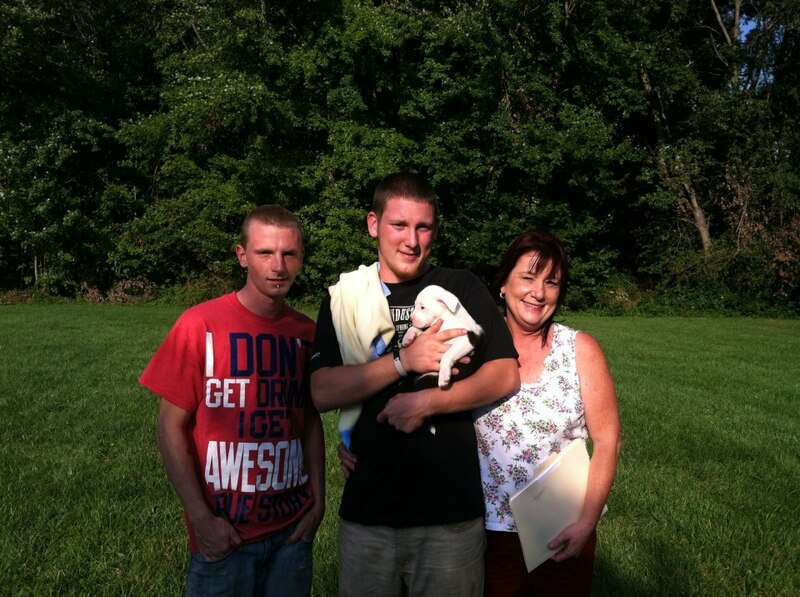 Congratulations on your new family that will love you forever! Charlie was officially adopted by his forever family tonight, 7/31/12. We are so excited for him to begin his wonderful new journey in life with such a great family. Welcome home, Charlie! We love you so much! 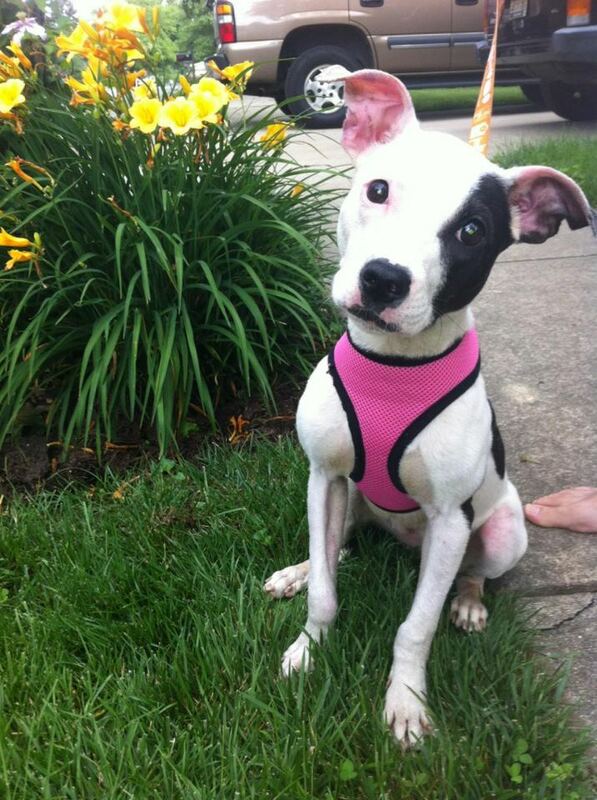 Everyone remembers the heartbreaking story about Anna (pictured above) and her two sisters who were pulled from the PSPCA by Pit Bull Pride of Delaware on July 4, 2012. They had been used as fighting bait and were covered in scars and scabs. Then after all of that torture, this little girl Anna had to fight again for her life against a terrible battle with pneumonia. After a lot of TLC and oxygen to help her breathe, combined with the diligent care of the veterinary staff from the Veterinary Specialty Center of Delaware, Anna made a full recovery. This little girl has made quite a come back and is feeling much better. Below is a picture of this happy angel with her forever mommy. We are beyond ecstatic to announce that she was officially adopted last night, 7/29/12, and will live an amazingly beautiful life in her new home. Thank you all for your incredible support! Here is Anna in her new forever home. Welcome home, Anna! 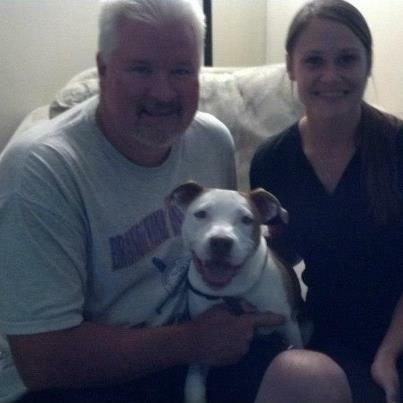 We are so excited to announce that Bandit was officially adopted on 7/16/12! He went from a dog found as a stray to a dog that now has his special forever family. He has been adopted into a home with a cat and 2 ferrets! His mom and dad love him very much! Congratulations, Bandit! Marley was officially adopted on 7/14/12 and we are thrilled! We were fortunate enough to pull Marley and her 8 puppies from a high kill shelter in Maryland less than 24 hours before they were all scheduled to be put down. 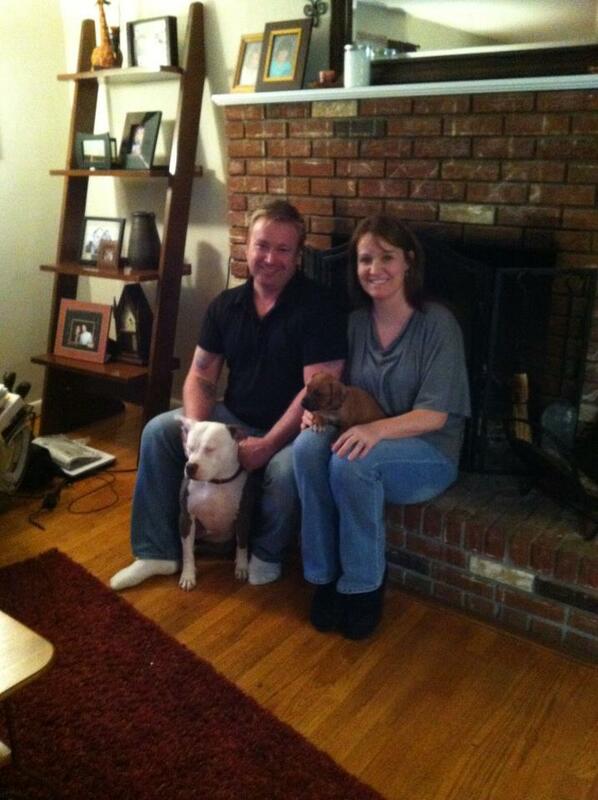 This is Marley with her forever family and we are so happy that she has found her forever home. We love you! Welcome home, Lexus! Lexus, also known to us as Lexi, is a 7 year old dog with a young heart. Her foster family fell in love with her and decided they didn’t want to give her up! Here she is with her forever family. Adopted on 7/10/12. Our little princess, Monroe, made herself right at home in her new forever home. We know she will be the center of attention with her new family. She was adopted on 7/1/12. Here is Jackson and his forever dad! 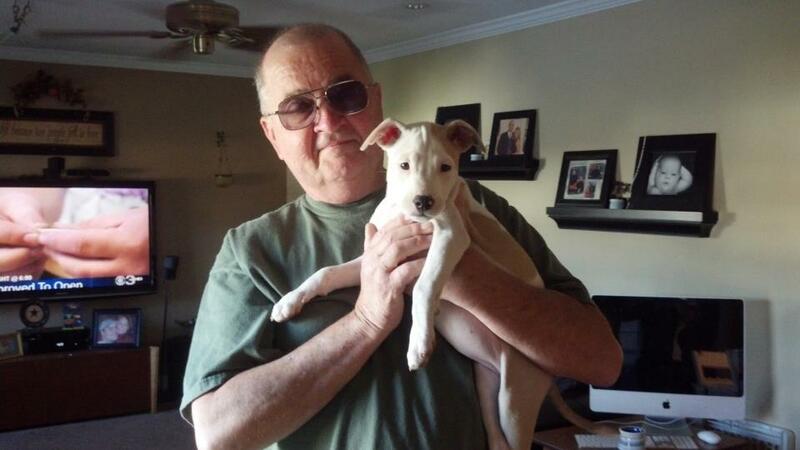 He couldn’t be happier to adopt his first rescue dog! Congratulations, Jackson! Adopted 7/8/12. Congrats Quincy on finding your forever family! He was adopted on 7/1/12!We just LOVE happy tails! 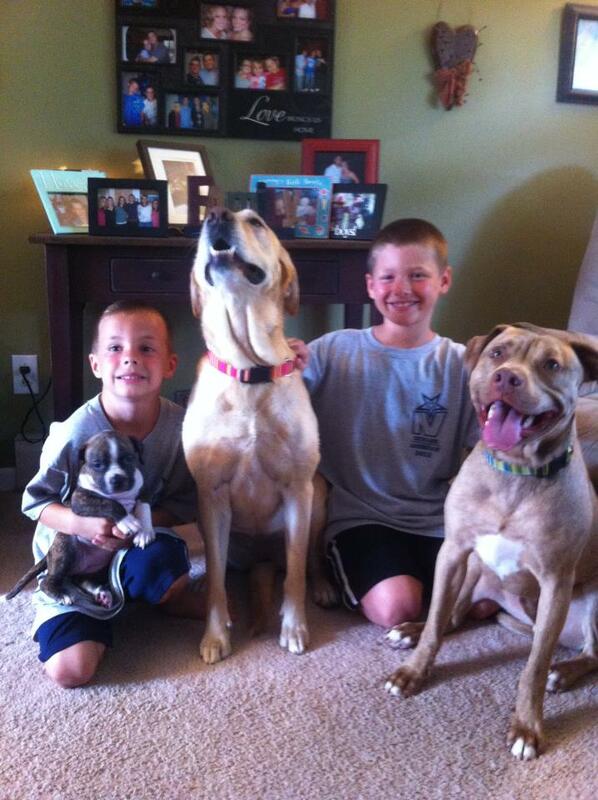 Here is Kennedy (pictured far left, from Marley’s litter) with her new big brothers, doggy brother and sister. You can say it was love at first sight! Kennedy was adopted by member of PBP. She couldn’t resist this sweetie! Kennedy is living the good life with her new big family! Congrats Kennedy! She was adopted on 6/30/12! 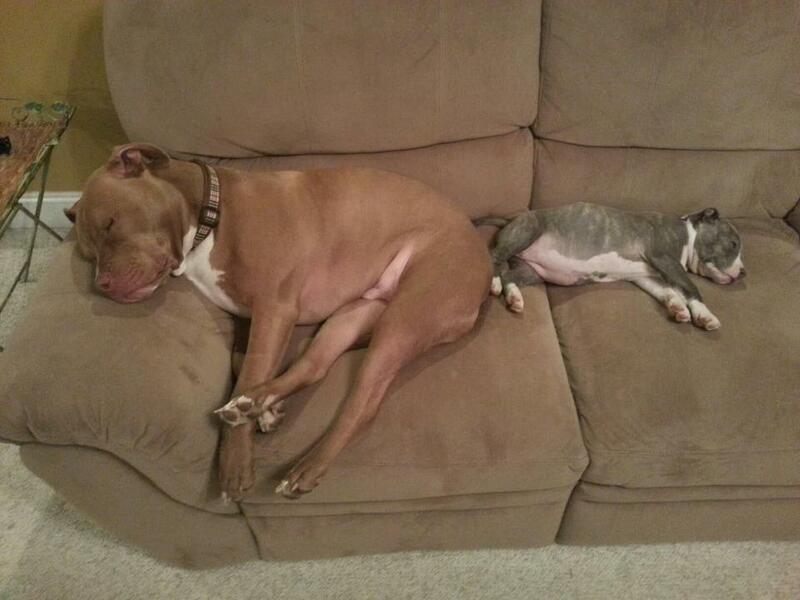 Gigi just adores her new forever family. She even loves her new parrot friend. Gigi adores the kids and is so happy to have a family that will love her for the rest of her life. 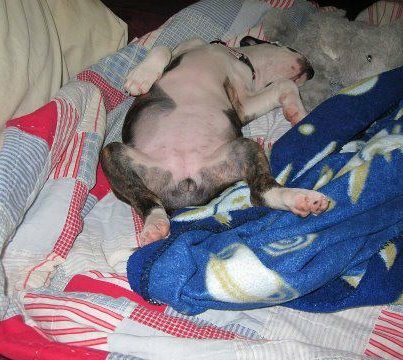 Zeus was found in an abandoned house. It was love at first sight when he met his sister, Bella. Here he is with his new forever family! Go Zeus! He was officially adopted on 6/14/12! We pulled Brandy from a high kill shelter in Maryland. She was placed into a foster home and was officially adopted by her loving foster parents on June 8, 2012! We are so happy for her! GOO Brandy! Roxy’s previous owner could not keep her because of his long work hours. Roxy is super sweet and well behaved. Special thanks to her new mommy, Stephanie! 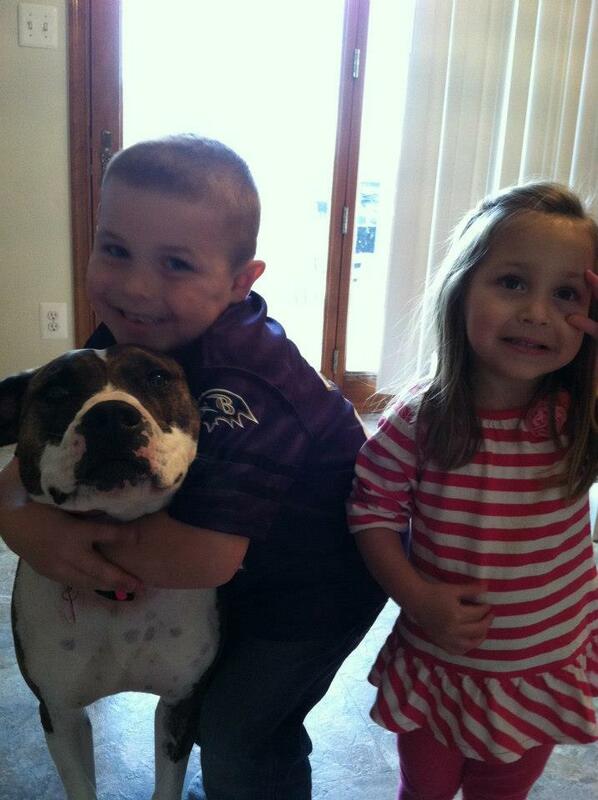 Pit Bull Pride of Delaware has officially adopted Roxy into her new home on 4/2/12! Scoob came into the shelter as a stray from the city of Wilmington. 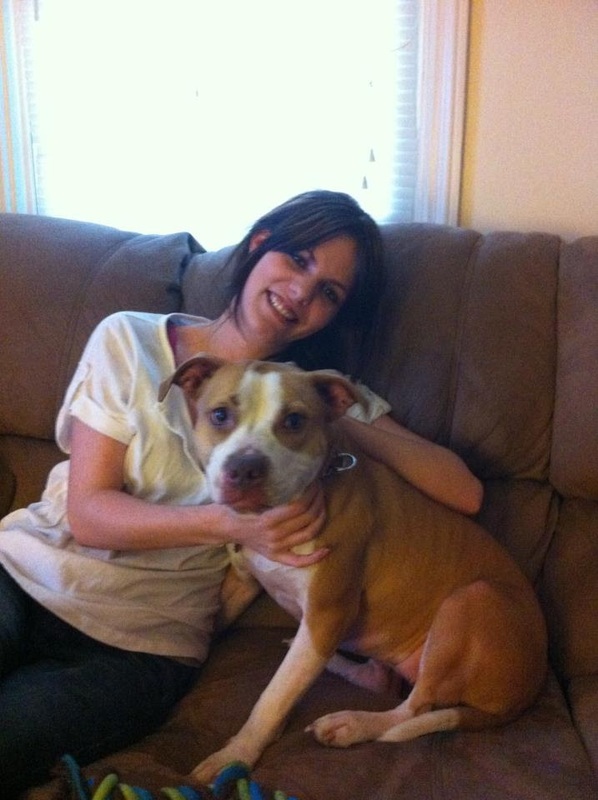 Lauren, founder of Pit Bull Pride, met Scoob while she was standing in the lobby at the Spca. She kneeled down to say hello to him and he jumped into her arms. He was abandoned and was extremely underweight. He weighed in at only 34.5 lbs. Lauren decided that she wanted to give him a calm stable environment. She took him home 3 days before Christmas. 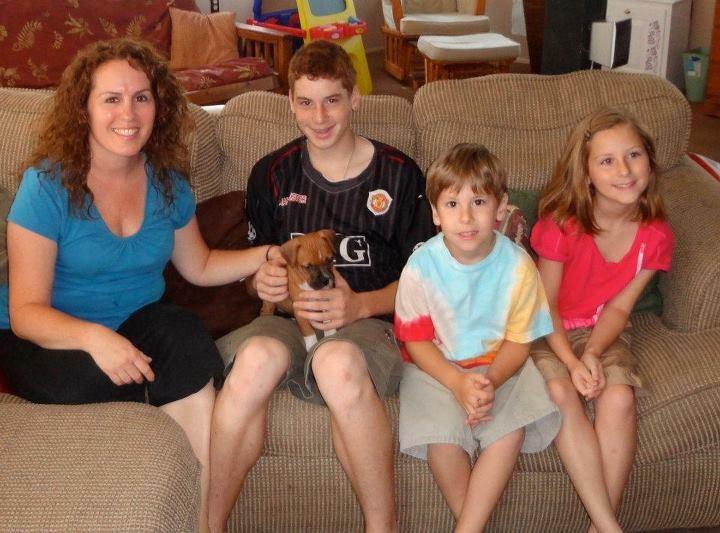 Less than 2 months from the time Lauren brought him home, a family came and adopted him. He was placed in a home with a 14 month old baby, two loving parents, and a pittie sister who he adores! He weighed in at about 58 lbs! Go Scoob! Sasha was picked up as a stray in downtown Wilmington. 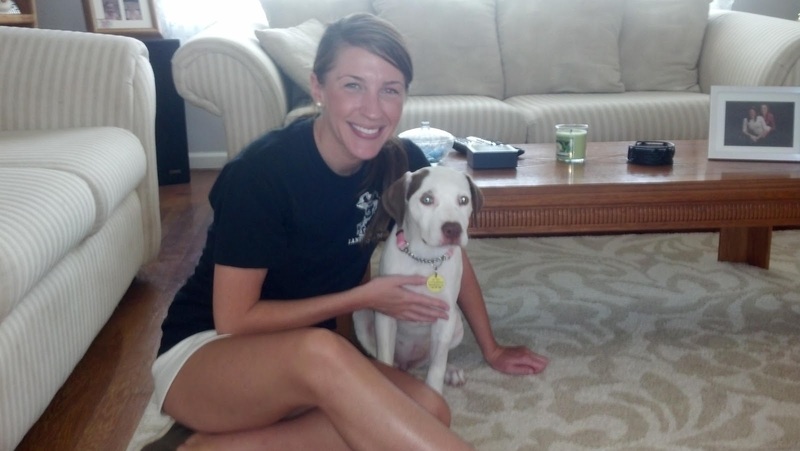 Lauren, founder of Pit Bull Pride, met Sasha while volunteering at the Delaware SPCA (Stanton). Lauren fell in love wtih her cute little face and brought her home that day as a foster. Sasha immediately got along famously with Lauren’s two dogs. During their first off-lead outing, Sasha behaved like an obedience school champ! Even after being in a cage for so long, she came when called, stayed when told and enjoyed an unlimited playtime! Less than two weeks from the day Lauren brought her home, her friend Ricky came to adopt her. Just like that, Sasha had a home in time for Christmas of 2011.